Delightfully demure, these luminous blush pink pearl droplets suspend from glamorous cubic zirconia settings. These delicate and dainty drop blush pink pearl earrings offer a sophisticated touch and will beautiful complement a range of bridal looks, from classic to vintage to modern silhouettes. Pair these drops with blush pink or ivory wedding gowns for an ultra glamorous finish. The ALLURA earring set is ready to ship. Please allow 5-7 business days for processing plus delivery times. The ALLURA blush pink freshwater pearl earrings have a timeless sophistication which we adore. 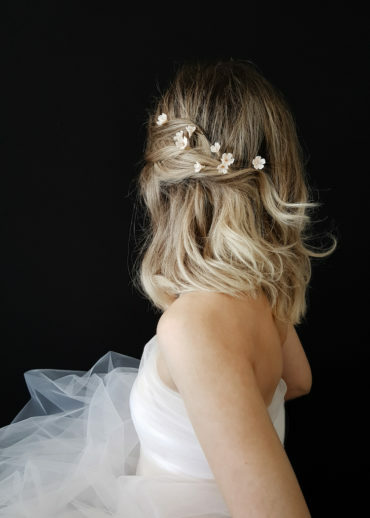 The soft natural blush tone can be difficult to find but we have been fortunate to find these natural beauties to offer our blush loving brides. The short length set adds glamour in an instant without feeling too long or overwhelming. We love to pair this set with blush toned wedding gowns of both vintage, modern or classic styles. Style this blush pink set with our BLUSHING, COCO, OPHELIA, TEAROSE or WHISPER hair piece styles. The ALLURA set can also be styled with our full range of wedding veils, with or without blushers.